In May, 1918, an event occurred in Moscow which was recorded in many memoirs of the period. An icon of St Nicholas the Miracle-worker situated over the gates of a Kremlin tower, which was covered with a red cloth by the Bolsheviks, miraculously revealed itself. Those who saw shreds of the cloth confirmed that it was torn into shreds, and not blown away by wind. News of the miracle instantly spread throughout the city. 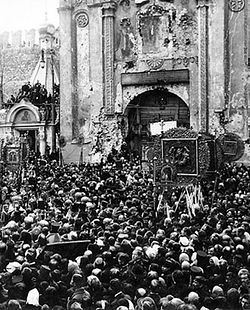 Several days later, on the springtime feast day of St Nicholas, processions of the cross convened in Red Square in response to a call by Patriarch Tikhon. The plaza was filled to capacity. Later, it was rumored that the crowd had stretched as far as Sadovoye Ring. Under the roar of the Red Army’s rifle shots from the Kremlin walls, the believers performed a moleben. The Muscovites accepted the supernatural immediately, for this icon of St Nicholas the Miracle-worker had already incredibly saved itself once before: in 1812, when the French invaders ignited explosives in St Nicholas Tower, the icon survived unharmed. There is neither documentation nor witnesses who could provide details of the fate of these gate icons. But anyone visiting Red Square could see the white stuccoed marks where these icons once were. Many have expressed their willingness to investigate this mystery, but it was the Fund of St Andrew the First-Called that was given approval to do so. In May, 2007, Vladimir Yakunin, President of the Council of this organization wrote an appeal to the authorities to allow them to examine Spassky, Nikolsky and Kutafia Towers. Permission was granted, and, with the blessing of His Holiness Patriarch Alexy II, the Fund formed a committee to restore the gate icons of the Moscow Kremlin. Three years were spent on approvals and agreements. In the beginning of 2010, the Director of the State Archives, Sergei Mironenko, provided the committee with a document which gives hope that the gate icons may have survived. This was an order issued in 1925 by a certain Rykov, President of the Soviet People’s Committee of the time, to issue funds for the conservation of the gate icons. However, in 1927, the renowned artist and restorer Igor Grabar, in one of his lectures, referred to these icons in the past tense. Mikhail Yakushin, Vice President of St Andrew’s Fund, thinks that it was within these several years that the icons over Spassky and Nikolsky Gates were not destroyed but immured. The icon over Spassky Gate depicted the Savior with St Sergius of Radonezh at His feet, together with St Varlaam, who was Metropolitan of Moscow during the Crimean Tatar invasion of the 16th century. It was presumably painted circa 1521, after the retreat of Khan Mehmet-Giray from the capital. The icon of St Nicholas the Miracle-worker on Nikolsky Tower is considered even older, dating back to the end of the 15th century. “Indeed, it appears that it is in this condition that the icon was covered by plaster,” says Mikhail Yakushin. “In 2004, the hierarchy of the Russian Orthodox Church Outside of Russia, through His Grace Bishop Michael (Donskoff) of Boston made an unofficial appeal to our Fund and to the Center of National Glory regarding the need to return the icons to the Kremlin Towers. In fact, it turned out that Vladyka had photographs of the icon on Nikolsky Tower that was published in one of the emigre periodicals. 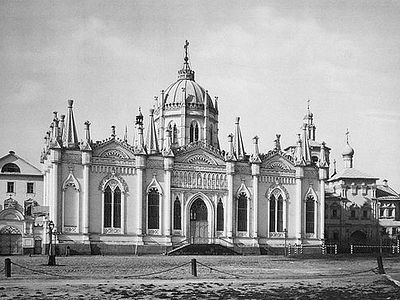 The photograph dated from 1917, after the damage inflicted by Bolshevik gunfire. 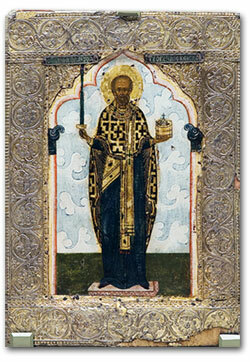 It depicts the icon of St Nicholas with a sword in his right hand. But his left hand, holding a city, was ridden with bullet holes. According to tradition, Patriarch Tikhon sent the photograph of the ‘wounded’ St Nicholas to Admiral Kolchak, and after his death, this icon of St Nicholas became the symbol of the White Movement and the first wave of emigres. “When Vladyka Michael gave us this photograph, it became apparent that we could consider recreating the icon on Nikolsky Tower. Even if the original icon was no longer in existence. “So we are not talking about restoring, but recreating a copy of the icon according to this image. Of course, we would not only need to obtain permission from the Federal Security Service, which has authority over Moscow’s Kremlin, but coordinate the effort with UNESCO, since the Kremlin is included in its World Heritage List. “Yet we are convinced that the icons, covered by layers of plaster, are still in place. What their condition is now, we don’t know, but we believe that they are still there. So without further ado or photographs, we decided to find out. On the eve of the Red Square Parade devoted to the 65th anniversary of the Victory over the Nazis, we partially uncovered two of the icon niches, on Spassky and Nikolsky Towers. Professional restorers made tests, and, to our delight, they discovered a layer of paint covered by metal meshing. “Very soon, the restorers will be able to compare the visual and written evidence with what has been plastered over for decades, and scholars can continue their research on the possibility of restoring or recreating the icons on the other Kremlin towers. The Fund of St Andrew the First-Called confirms its resolve to cover all costs relating to the restoration of the icons of the Moscow Kremlin. 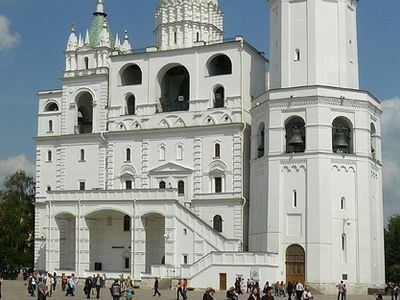 “Our group is unanimous in its opinion,” said Vlasimir Yakunin at a press conference, “that we must continue this project according to the ‘do-no-harm’ principle, without haste, so that the historic image of the Kremlin would be recreated and that the images of the spiritual heritage of our people would once again be seen in the Kremlin towers and in our lives. As far as deadlines are concerned, they will be determined by the restorers. Of course, we would like to complete the main portion of the uncovering of the icons by the end of summer, before the onset of the rainy season. 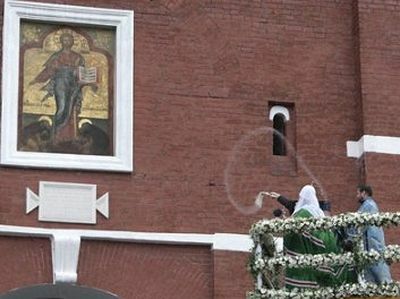 His Holiness Patriarch Kirill defied driving driving rains today to bless the icon of Jesus Christ, recently restored over the main gate of the Moscow Kremlin.